This week's Free GM Resource is a generic utility that I think might help some GMs with their game prep. Since I already have what feels like a bazillion computer tools at my disposal it isn't normal for me to be unable to utilize just about any file type I comes across, but every once in a while I have something in one format that I cannot use. 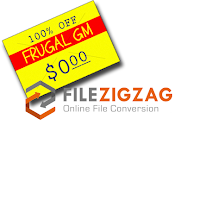 Enter FileZigZag, a free online tool that converts one file type to another. At first glance this converter tool looks like it only does a few types on conversion, but this is misleading because the homepage only lists the "most popular" converters. Pop on over to the list of available conversions and odds are if you have file type "A" that really needs to be type "B", FileZigZag can help get it there. If you beg, borrow, and/or steal material for use at your home game, you need this tool in your arsenal.